This employee is responsible for the development, implementation, direction, control, and evaluation of community-based and health center-based Public Health Nursing Services. SONA is selling T-shirts to support your organization. A photo is listed below and the order form is attached. The member price per t-shirts is $15 and they are available in sizes S, M, L, and XL. There is an additional $2 charge for size XXL. Delivery options are available at both the SONA and the RNA office. 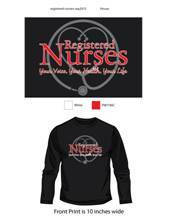 If interested in ordering, please submit this order form to info@sonanet.org, mail the attached form with payment, or contact us at 513-426-6582 with your name, address, email address, and phone number as well as the size and quantity you wish to purchase. The Southwestern Nurses Association (SONA) is a local district of the Ohio Nurses Association (ONA). Membership in SONA is open to nurses who live or work in Brown, Clermont, Clinton, Hamilton and Warren counties. Membership in SONA offers Registered Nurses opportunities for involvement in issues of interest to nursing and healthcare as well as discounts and other benefits. SONA has a membership newsletter and holds general meetings at various locations in the greater Cincinnati area. Meetings provide opportunities to meet and network with other RNs. Educational programs are offered throughout the year to aid in the earning of continuing nursing education (CE) credit. The mission of the Southwestern Ohio Nurses Association (SONA) is to advance professional nursing and quality health care in the district. This mission is accomplished by furthering SONA’s leadership and advocacy roles in the community through education, communication, collaborating and mentoring. The Southwestern Ohio Nurses Association (SONA), a constituent of the American Nurses Association, is a collaborative organization of registered nurses recognized as a proactive leader in the promotion of nursing and quality in health care. The SONA Bylaws changes were unanimously approved at the Annual Dinner Meeting on June 24, 2015. Please click here to view the 2015 bylaws.